The American Wirehair should be more popular. The coat is interesting and the body conformation balanced and regular. The American Wirehair was first developed in the United States in the 1960’s. This is a very rare breed of cat if registrations with the Cat Fanciers Association (CFA) is anything to go by. They had (perhaps still have) the smallest number of registrations with the CFA; 22 cats were registered in 2003. There are 41 CFA breeds registered. In fact since building this page having researched rare cat breeds, I would place this 8/10 in terms of rarity. This cat breed is very similar to the American Shorthair cat except, of course, for the coat. 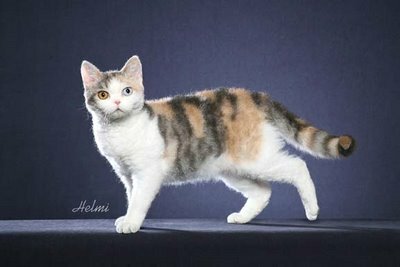 Having seen an American Wirehair at cat shows, they seem quite fragile (if that isn’t the correct word) and certainly less robust than the more solid American Shorthair. This, though, is my opinion. The story of the origin of this breed varies slightly. This is not uncommon. 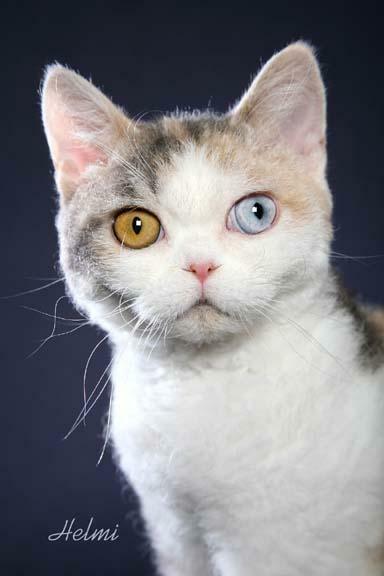 However, the breed’s origins are similar to that of a number of breeds of cat; a spontaneous mutation of a gene. In this instance it occurred in the birth of a litter of 6 kittens. One of the kittens, a male, had a curly and dense coat unlike any other. The parent cats were both American Shorthair barn cats (this resembles the origins of the LaPerm cat which also has a Rex [curly] type coat) living in New York state. The person who took charge of the litter, who I will presume was the owner of the barn where the cats lived, contacted a local breeder, of Rex cats, Mrs. William O’Shea. Mrs O’Shea bought the curly haired male together with a female from the same litter who had normal hair. She called the male ‘Council Rock Farm Adam of Hi-Fi’, and the female ‘Tip-Toe of Hi-Fi’. She developed the breed from these two cats. 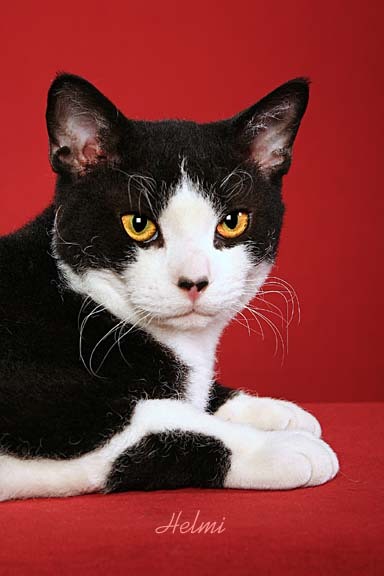 The breed was then further developed by mating the wire haired cats with American Shorthair cats amongst other breeds. All cats of this breed have Adam as a distant relative. This all started in 1966. The breed was first registered by the CFA in 1967 and Championship status was granted in 1978. A relatively smooth passage to full status. The American Wirehair is unique to America. What is also unique is the coat, which is different to all other breeds. As is the case for the Persian cat, there is a wide variation in coat texture. The genetic mutation is dominant meaning that approximately half the litter will have wirehair if an American Wirehair is outcrossed. A hard dense, springy coat texture is the most desirable (wiry or coarse as the breed name suggests). See another Helmi photo of the above cat. The American Wirehair is a medium sized cat (go to domestic cat breed size) weighing between 8 to 15 lbs2 (3.5-7kg) although I think the upper figure is too high. The fur coat is thick and tightly crimped. The fur is also springy, dense and coarse, and even the whiskers are often curled. The fur has been described as like “steel wool”1. The head should be medium sized inline with the medium sized body. The cheekbones should be high. I found this very noticeable in the cats that I saw at shows. The bone structure is less substantial than that of the American Shorthair. They can be outcrossed with the American Shorthair. Conformation (the look/shape of the body) is similar to the American Shorthair, muscular and strong. This is because the breed is outcrossed to the American Shorthair. The cat is therefore athletic. The American Wirehair comes in a range of “traditional category colours” 1. The breed colours are: self and tortie, smoke, shaded and tipped, tabbies, shaded tabbies, bi-colours. They have been described as “busy, occasionally bossy”2. They are also described as playful, affectionate and loving1. 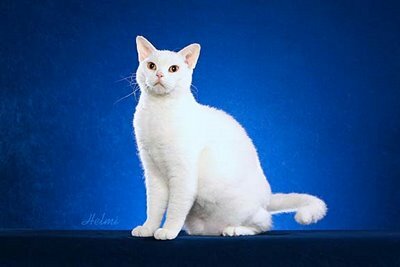 I won’t go into the character of this breed because in my research I have found that all cat breeds have similar personalities born out of their domestication; that is affectionate and people orientated. This is to be expected. In fact the American Wirehairs shares the same or similar personality to the American Shorthair. They are also agile and active. There will be differences between cats of the same breed due to environmental influences and these differences are in my opinion greater than the inherent differences found between the various breeds. The CFA recommend the cat be kept indoors as it is so rare. Clearly, if kept indoors (s)he should have adequate means to exercise and entertain herself. They take a great deal of interest in their surroundings and are for the most part quite affectionate and intelligent. The dominant gene wirehair gene is symbolized by the letters Wh. The coat develops slowly. The wirehair gene produces fur that is quite fragile as it is prone to breaking. A dense coat is preferable and breeders select for this. The wirehair gene has “incomplete dominance” (partial dominance). The word “dominance” in respect of genetic science refers to the fact that the allele (one copy of a pair) can have different effects on the look of the cat despite being the same allele (on copy of a pair of genes). I’ve written a bit more on this page: American Wirehair cat. If you’d like to be a listed breeder, either on this page (free) or a full custom designed sponsored page, please contact me. This breed is recognised by ACFA, CCA, TICA and CFA. This entry was posted in American Wirehair, Cat Breeds and tagged american wirehair, cat breeds, pictures of cat breeds by Michael Broad. Bookmark the permalink.